Google's entering the micropayment game thanks to a new service aimed at providers of written content, the company confirmed to TechRadar. The new program, which launched Tuesday, allows users to buy individual web articles from $0.25 (UK£0.15, AU$0.24) to $0.99 (UK£0.61, AU$0.94) each. Once a reader purchases the content they will keep it forever, according to Google. The program uses Google's existing digital wallet service, Google Wallet, which stores credit card info and loyalty cards for users to shop with on or offline. Publishers can give readers a preview of an article, while the rest of the material will be opaque to give readers a sense of how long the rest of the story is. Then, users can press the Google Wallet button to unlock the rest of the content. All publishers have to do is install a code on their servers to enable Google Wallet. If a user is unhappy with his or her purchase, then they are able to get an "instant refund" within 30 minutes of the buy. However, Google will guard against excessive refund abuse. Google has been a little choosey with its first dance partners. So far, it's teaming up with Pearson and Oxford University Press, which will both post 80,000 total reference articles for purchase. Google's also working with DK Publishing and technical book publisher Peachpit. If things go well with the pilot sites, other publishers are sure to get in the game. Google will soon create plug-ins for popular web publishing platforms to help facilitate the service. Google Wallet has so far mainly been used to buy physical good, whether or not it was purchased in store or online. It uses NFC terminals to allow users to shop physically at many stores such as Macy's, Jamba Juice, OfficeMax, and Old Navy. Online shoppers can also use the Google Wallet button on sites such as Buy.com, TigerDirect.com, or to buy movie tickets from Fandango's mobile movie service. This isn't Google's first foray into facilitating the trade of purely digital goods. Wallet is already used to help gamers buy digital items in the virtual world. However, its digital gaming trade doesn't offer any instant refund functionality. Many services have tried to create systems where buying content online is easy and safe. But other attempts to create such digital economies by micropayment companies such as CyberCash, Peppercoin, and BitPass have failed. Experts theorized many digital financial exchange systems haven't worked because they require users to install software and deal with complex interfaces. Users also appear to be skittish about handing over their credit card info to companies they don't really know and buying content without a safety net. But Google Wallet may solve those problems: it's has been around for a while now and users trust the brand more and more. After setting up an account, users can just press a button to buy content. And if users are unhappy with their purchase, they can get an easy refund. It's hard to predict the impact Google Wallet will have on the market, but it may just be the solution to the ailing newspaper industry. Media companies have had problems selling online content to consumers ever since the internet began. A quick and easy way to buy articles may be just the tool they need to become solvent in an environment where pirating their content is as easy as copy and paste. "Users love free content, and so we expect that advertising will remain the most effective monetization model for most content on the Web," the post said. "However we know that there is more great content that creators could bring to the Web if they had an effective way to sell individual articles that users can find with search." This might be the first step to creating a ubiquitous internet economy, with a safe, standardized method of payment across the digital environment. Buying something with the press of a button from a website you've never visited may replace the arduous process of entering in credit card info with every internet vender. 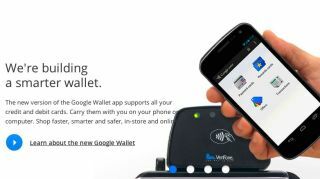 Google Wallet may even one day replace real wallets, and buying something online or in a store may become similar. But that's all in the tea leaves, and Google Wallet's success depends on how many venders and consumers it can get to start using the entire service. Google has yet to announce how it'll make money off the service, though presumably it'll take a cut of the transaction. But Google may just receive the gold doubloon for slaying content providers' white whale.